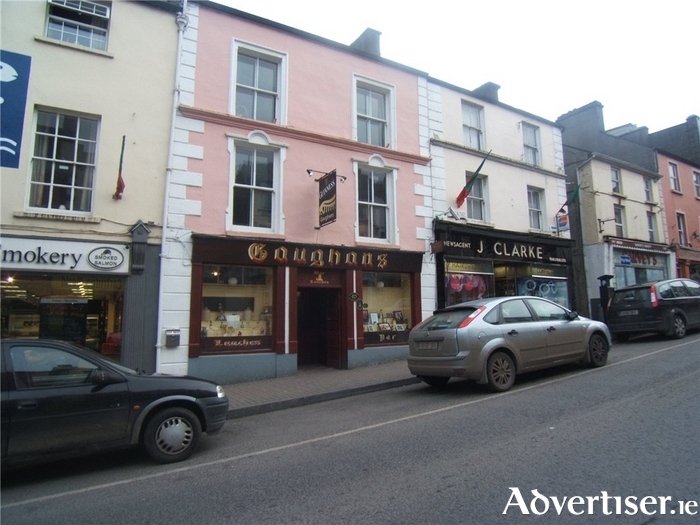 This is a unique opportunity to acquire a substantial residential and commercial premises for sale at O’Rahilly Street in Ballina town centre, located in a prime retail district offering easy access to all other main shopping streets in the town and flagship stores such as Penneys, Heatons, Boots, and the post office. This location benefits from high levels of vehicular traffic and pedestrian footfall with access from O'Rahilly Street and from Hill Street. The property includes generous living accommodation above the commercial premises as follows: kitchen/dining/living room with double doors leading to paved patio area with barbecue, sitting room, and utility. There are three double bedrooms with master en suite and walk-in wardrobe, one single bedroom, family bathroom, and a study completes the second floor. The ground floor of the property previously operated as a bar/restaurant and snug. This consists of large open plan retail/restaurant area, ladies' and gents' rest rooms, kitchen, cold room, and storage to the rear. Overall ground floor area 134.2sq m approx (1,445sq ft ). This premises is in a thriving location which offers excellent potential to any intending purchaser. The property is located 14km from the sandy beaches of Enniscrone and 60km from Sligo along the Wild Atlantic Way. Close to River Moy, world famous for salmon fishing, and 41km approx from Ireland West Knock International Airport. Viewing is highly recommended. BER D2; asking price: €250,000. For more information contact Nuala Feeney, Sherry FitzGerald Feeney West, Ridgepool Road, Ballina, Mayo. Call: (096 ) 72828 or email: [email protected].